The audio tape, broadcast on al-Jazeera TV, urges a boycott of the US dollar "to free humankind from slavery". It comes days after another tape said to be from Bin Laden was released, praising the attempted bombing of a US airliner on 25 December. 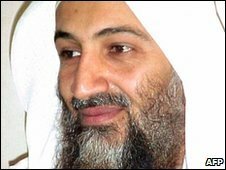 But IntelCenter, a US group that monitors Islamist activity, has said the voice on the earlier tape appeared to be that of Bin Laden. The tape also urges a boycott of the US dollar. "I know that there would be huge repercussions for that, but this would be the only way to free humankind from slavery... to America and its companies." Responding to the earlier audio tape, also broadcast on al-Jazeera, US President Barack Obama said it indicated how weakened Osama Bin Laden had become. "Bin Laden sending out a tape trying to take credit for a Nigerian student who engaged in a failed bombing attempt is an indication of how weakened he is, because this is not something necessarily directed by him," he said. A Nigerian man, Umar Farouk Abdulmutallab, is charged with attempting to blow up a transatlantic US airliner over Detroit on 25 December. The Yemen-based regional wing of al-Qaeda has said it was behind the attempted attack.